Order Form Welcome to Karen's Kreations. 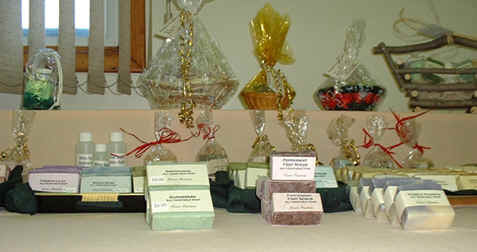 You will find a large variety of handmade soaps made with only natural ingredients. Available soaps change constantly as I make different batches and sell out on others. I began this part-time business simply as a hobby that grew - I am a hobbyist at heart. All of my soaps are made with 100% vegetable oils (except the soaps listed under Tallow) and contain no animal products. My soaps are made with no fillers or detergents, leaving in all of the natural glycerin which is one of the reasons it is so good for you ... it moisturizes and softens ... goodbye to itchy, irritated dry skin after your bath or shower! leave you feeling refeshed. The fragrance oils are completely skin safe. may vary slightly from bar to bar. The average cost per bar is $3.00 -$4.00 . See the print order or catalog page for more detailed costs on an item.